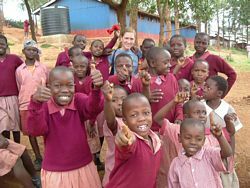 Volunteers in Kenya will have plenty of opportunity to work with disadvantaged communities all over the country in various volunteer in Kenya projects. The following are some of the volunteer Kenya projects that Advance Africa works with. Volunteers can work in a variety of programs in a city or rural setting. There will be general guidelines and description of your project before you begin volunteering. An orientation and training will take place upon your arrival. If you have not indicated any preference, placement will be according to the current needs and requirements, with consideration of your skills and background.